Choosing a vet should be top priority. Your vet is a pretty important person in your dog’s life – as well as in yours. Hopefully, you’ll only need him or her for routine checkups and preventative stuff; but just in case, it’s worth taking the time when choosing a vet to get a good working relationship going with the right one, BEFORE you need their services. You could just choose a vet from the Yellow Pages or from an Internet search; but having the right vet could be critical to your dog’s health and happiness, and to your own happiness and peace of mind. Think about it this way: if you were trying to choose a doctor for yourself, would you be happy to just select one from the phone book? Probably not. You’d want somebody who comes highly recommended – somebody you feel like you can trust. Your vet isn’t just your dog’s doctor; they are also the dentist, manicurist, psychologist, and – hopefully! – a friend you can talk to about dog health. The best place to start looking for a veterinarian is by word of mouth. If you have any friends or relatives who take good care of their dogs, then that’s a great place to start: ask them who they’d recommend, and why. This last one is really important, because everyone has different priorities … their priorities for choosing a vet are not necessarily yours. You can also check the local training clubs. These organizations are almost guaranteed to place a great deal of importance on high-quality veterinary care, because the health and well-being of their dogs is such a priority. Once you’ve got a list of vets you’re interested in, all you have to do is call up the clinic and explain you’re looking to find a regular vet for your dog: can you come in for a quick chat and introduce your dog. Check them out before an emergency strikes or you have a sick dog. You’ll want a chance to talk to the vet, and discuss his or her approach to pet care. This is really important. If your dog ever really needs care (if there’s an emergency), you want to be sure that you’ve made the best possible choice in choosing a vet. While you’re there, you’ll want to assess your potential vet’s overall attitude and approach to dog health care and animals; and you’ll also probably want answers to some specific questions. What kind of testing and analysis capabilities does the clinic have, do they have to send away to a lab for this kind of stuff, this will definately mean the results are going to take longer to get. If your dog is very sick, time is an important factor. Are after-hours services are available? A lot of clinics close the doors in the evenings and on weekends, which means that if there’s an emergency, you’ll have to go somewhere else – and subject your dog (and yourself) to an unfamiliar vet. What’s their price range? How are payments made? 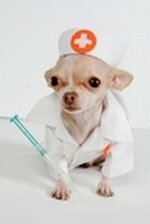 Is there a facility for payment plans in case of unexpected vet bills? The payment-plan option is particularly important. Even with pet insurance, vet bills can sometimes be astronomical. How up-to-date is the staff with advances in the industry? The field of medical care is always moving forward – responsible vets make the effort to keep up with the times, and see their staff do, too. When your choosing a vet, you’re balancing convenience and quality. There’s no right or wrong vet for you and your dog. There are lots of vets to choose from, and they’re all different! Even though it’s tempting to go for the one right around the corner with the rock-bottom prices, it really is worthwhile taking the time to shop around. Your dog absolutely depends on you for her healthcare – you’ll want to do the best thing by her. A good vet knows how to take care of you as well as your dog. The relationship you have with your vet should be one that’s based on mutual respect. When the two of you see eye to eye, it makes caring for your dog that much easier. For a complete survival guide on stress-free dog care, including detailed information on when your dog needs to see the vet, how to respond to pet emergencies, dog First Aid, and all common health problems, check out The Ultimate Guide to Dog Health. It’s a complete handbook on dog health care, and teaches you how to take a proactive and prepared approach to knowledgeable dog ownership.